I have my Used 2008 KTM XC 450 ATV for Sale with Razor wheels and Olin shocks. The used KTM XC for sale is a high performance 4-wheeler that has had no mods; it's all stock! The KTM XC 450 4 wheeler has low hours and basically looks brands new. If you're interested in taking a look at the ATV for sale you can reach me by e-mail using the comments form found directly below this classified. Strike Lightning Used ATV for Sale would like to extend an invitation to anyone who is having problems with their 2008 KTM XC 450 to leave their questions or describe the exact problem that you're having and your contact information in the space below and see if somebody who stops by may offer a solution for how to fix your motorcycle. 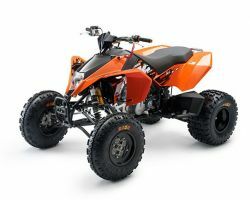 We also encourage bikers to submit their opinions and reviews of the Used 2008 KTM XC 450 ATV for Sale to help potential buyers make informed decisions and to benefit the biker community as a whole. The ATV is located in Maryland and my asking price is only $7,000.00 !